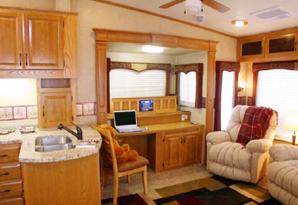 For our customers, the most important space is: space that you can comfortably live in. The longer one lives in the available space the smaller it becomes. Therefore we have worked hard at creating all the “good” space. According to our customers with the RT39/40SB, we have excelled at the real and perceived open living space. To do so, we had to make sure that our customers have an uninterrupted view, all the way from the rear recliner chairs to the bathroom wall at the door entryway. 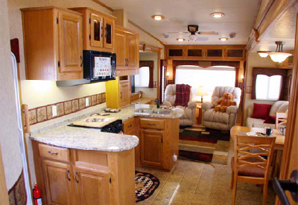 We really need a kitchen with all the “good” spaces but often fifthwheel manufactures install overhead cabinets with “L” returns that block front to back viewing space. Our RT39/40SB has no such obtrusive eyestopping overhead cabinets. Instead, we created upper and lower wall cabinets almost 8’ long and then added the great counter utility of a large lower cabinet”U” shaped layout. It just so happens that a “U” shaped kitchen cabinet yields excellent full depth drawer space, and lots of below-counter shelf space. This unobtrusive kitchen design is so successful at opening up total perceived living space, that shoppers often comment that we must not have sufficient kitchen space. A closer look at the total cabinet space volume, usable counter space and long pull out drawer space, belies that first impression. 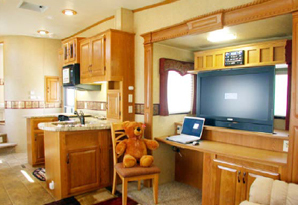 The working area for the combination desk/HD LED TV encompasses the full width of the curbside living-room slide-out. It is hard to find such a function desk working area. 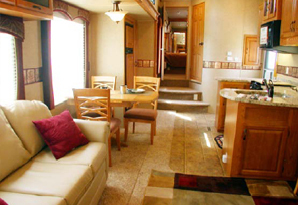 This floorplan, like all our RT models, is available with a roomy neo-round shower with no-drip shower door, air mattress sleep system, and real Granite counter tops. 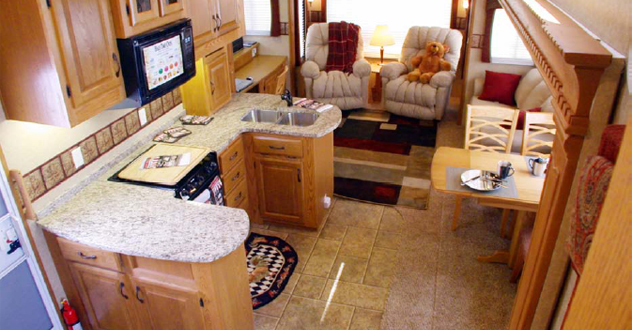 The RT39/40 floorplan with maximized design and customer space requirements, has become a main choice for full-timers. Almost 8’ long, functional “U shaped counter top, w/opt granite. 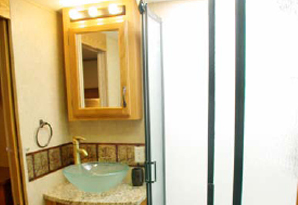 Usable space creating: Vessel sink on optional Granite counter-top Neo round shower with “no drip” bisliding doors. Left: pocket door entry to bedroom. Picture taken through door to side aisle-way between kitchen and bedroom. Left: Teddy relaxing on our Dream sofa. 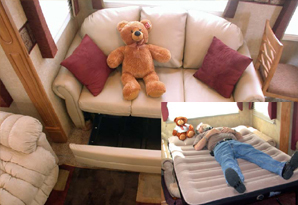 Sofa folds out into a very compfortable supportive air-mattress bed with no hard under-mattress cross supports. 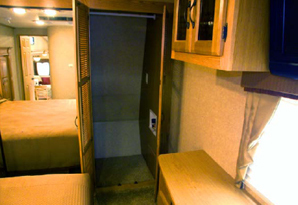 Below the stuffed seating area is a pull out drawer for bedding. Below inset: John Anderson who headquarters in New Mexico, tries out our Dream Sofa air-mattress. He fell asleep during the trial. Enough said! New RT39/30SB tripleslides at the upfitting center in Ekhart, Indiana. The foreground model has a custom paint accent. The far RT39/30SB has standard graphics. 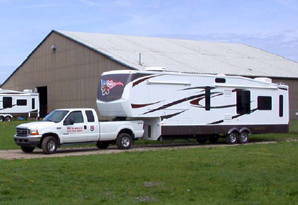 We have space for completing customer checkouts at the upfitting center as well as checkouts at the Elkhart campground. New RT39/30SB triple-slide. 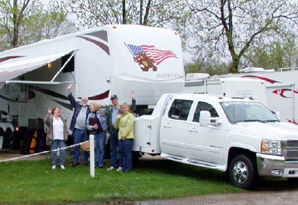 A rainy day customer and shopper checkout secession at the Elkhart, Indiana campground, near the factory. Debbie Huckstadt (on left) from Illinois has shopped us for 3 years & finallized her factory order. Meridith and Andy Gerrie (ctr) finished their new owner checkout. Paul and Linda Wigglesworth from Kentucky (on the right) also finalized their factory order. Their new tow vehicle was positioned in front of Andy and Meridiths new RT39/30SB to make sure that it looked as good as they had planned.